With the arrival of October, we also have the arrival of National Breast Cancer Awareness Month. 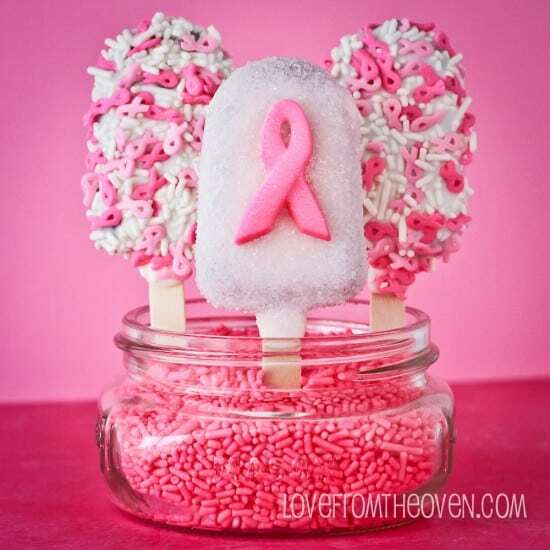 I usually try to come up with a few unique treats to help my friend Jen with her Breast Cancer Awareness fundraising she always does. It’s far more personal for her this year, as her mother was recently diagnosed with breast cancer. In addition to that, a friend of mine was also diagnosed this year. It’s certainly brought it all very close to home. 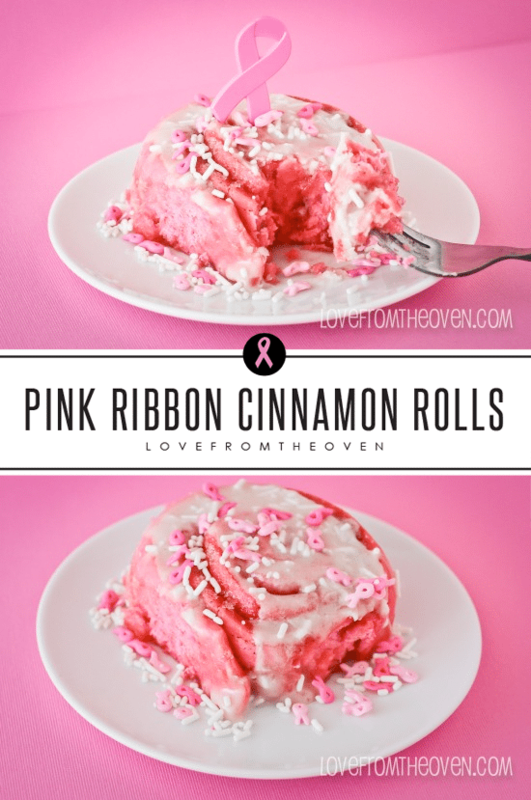 So in trying to come up with something creative for fundraising and awareness, I thought why not make cinnamon rolls… PINK. Not only could these be a great option for an early morning bake sale fundraiser, but also a great treat for so many of those who will be up early and walking in fundraisers this month. I made these the same way I make all of my cake mix cinnamon rolls but with two changes. I added a teaspoon of pink gel food coloring and instead of brown sugar in the filling, I used white sugar (mainly just to keep the filling from getting too dark in color). I added the food coloring at the same time that I added the yeast/water mixture to the dry ingredients. The color was a nice bright pink. You could certainly back off a bit on the color for more of a pale pink. Ah. Cinnamon rolls. The color pink. Love it. 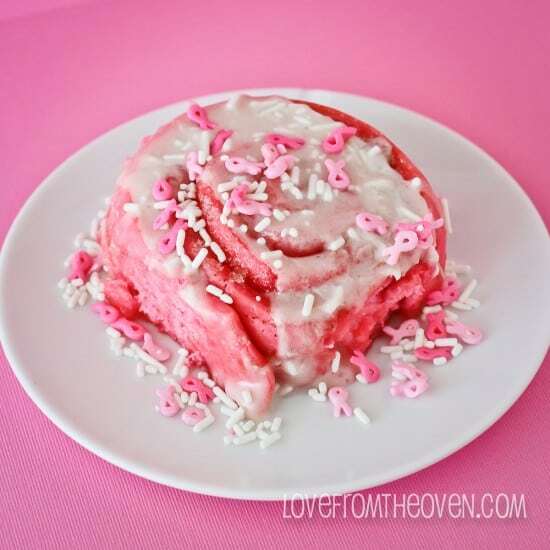 Add a frosting or glaze of your choice and some pink ribbon sprinkles, and you have some super cute cinnamon rolls to help in whichever way works best for you. 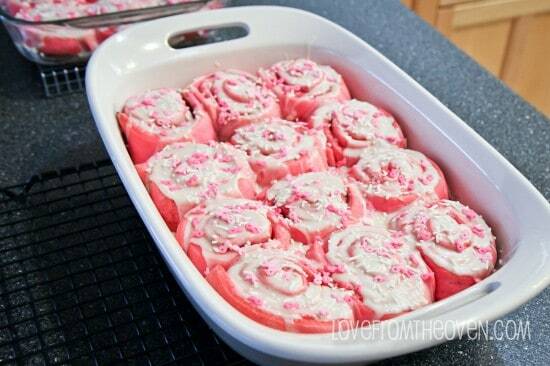 They taste just like the un-colored version of my birthday cake mix cinnamon rolls. Hopefully some of these ideas can help those of you that are fundraising this month. 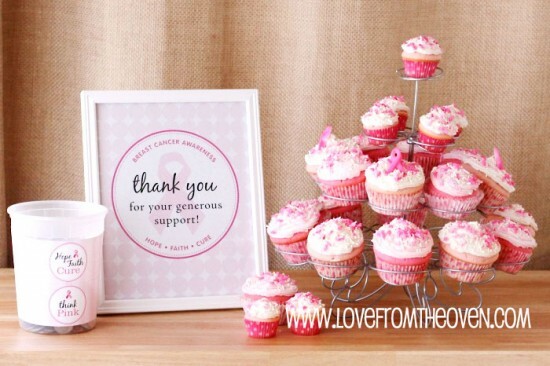 And if you are looking to help someone who is fundraising, please head over to my friend Jen’s “Tutus for Tatas” 2012 Race For The Cure fundraising page and send even a dollar or two that way. 1. Mix yeast, food coloring and warm water until dissolved. 2. Combine cake mix, salt and flour in a large bowl. 3. 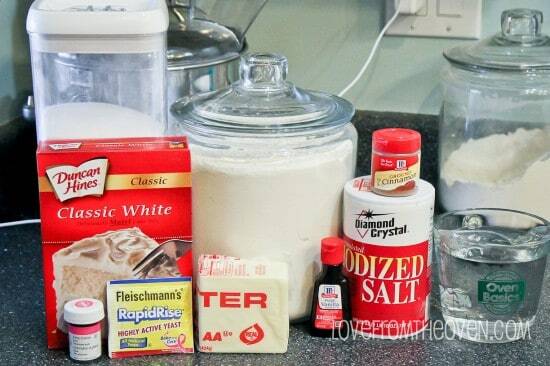 Add warm water/yeast mixture and vanilla to cake mix, salt and flour mixture. Mix well. This may require kneading with your hands a bit to completely combine ingredients. 4. Cover tightly. Let rise for one hour. Punch down and let rise again for another 30-60 minutes. 5. 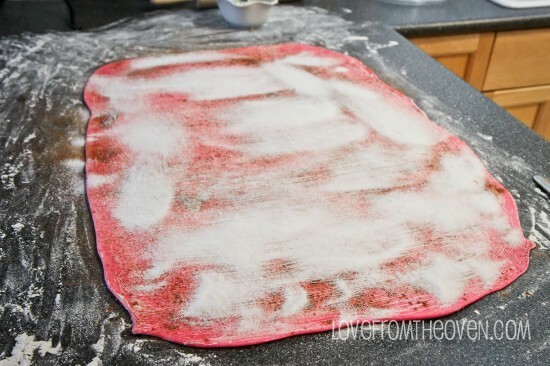 On a floured surface, roll dough into a rectangle shape, approx 1/4? thick. 6. Once dough is rolled out, brush with softened butter. I found that one stick was adequate for this recipe, but you could use more (or less) if desired. 7. Sprinkle with sugar. Sprinkle with cinnamon – use as little or as much as you like. 8. 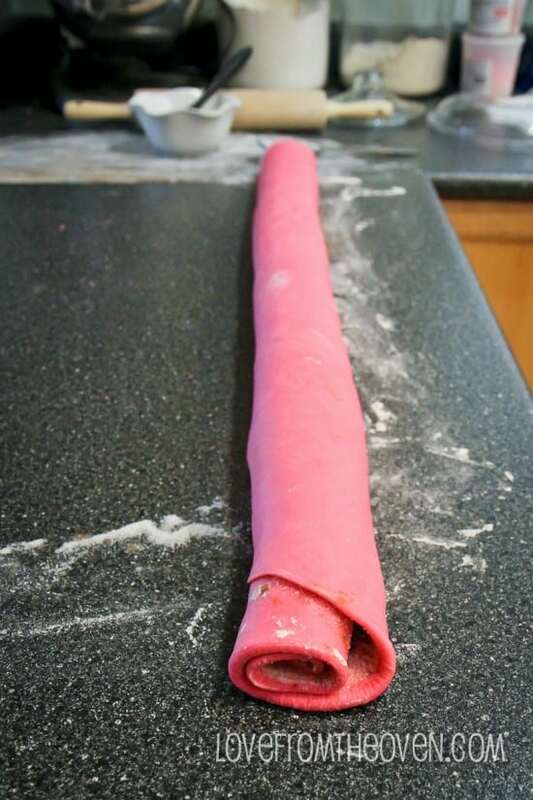 Starting at end opposite from you, roll the dough towards you until all dough is rolled into one long piece. 9. 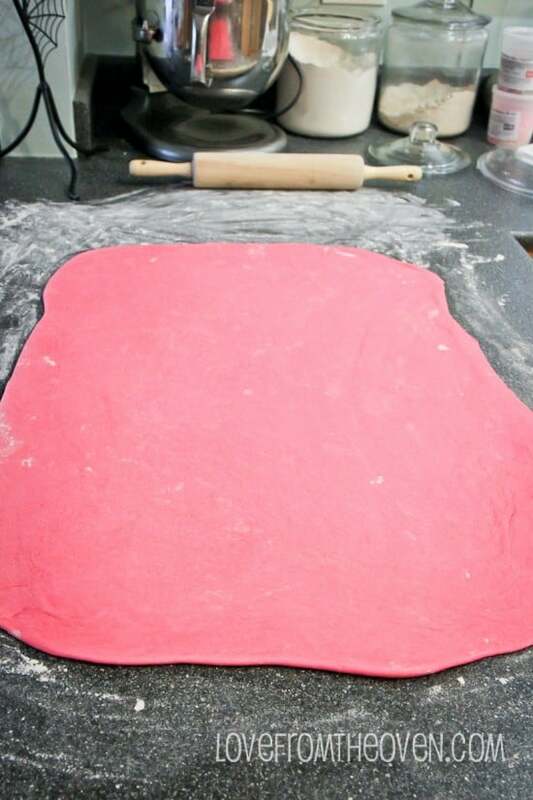 Slice dough into 24 equal sized pieces. 10. Place rolls in two greased 9×13 pans. Cover and let rise until doubled in size. I usually sit my rolls on my stovetop while my oven preheats to 350 degrees. This allows them time to rise and provides a bit of warmth from the oven warming. 11. Bake at 350 degrees for 15-25 minutes or until golden brown. My rolls took approx 22 minutes. This will depend on your stove and your preference for how brown you like your cinnamon rolls. 12. Remove from oven and let cool slightly. Beat cream cheese and butter with a mixer until creamy. Add in vanilla and milk, mix until well combined. Slowly add in powdered sugar and salt and beat until fluffy. Spread onto cinnamon rolls while they are still hot, allowing frosting to melt into the cinnamon rolls. 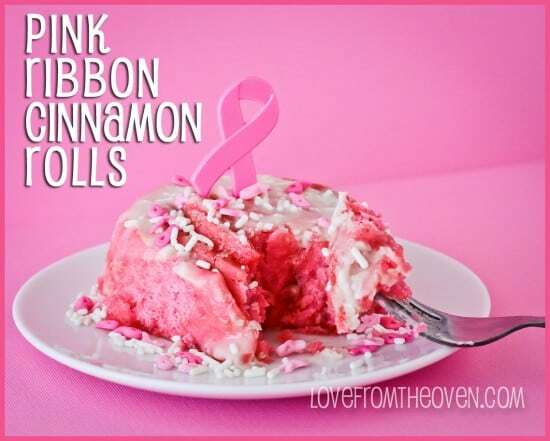 You can find the pink ribbon sprinkles here. What a great idea!! They look YUMMY!! I love it!! I so gonna make them!! ;) right on! These are absolutely amazing! 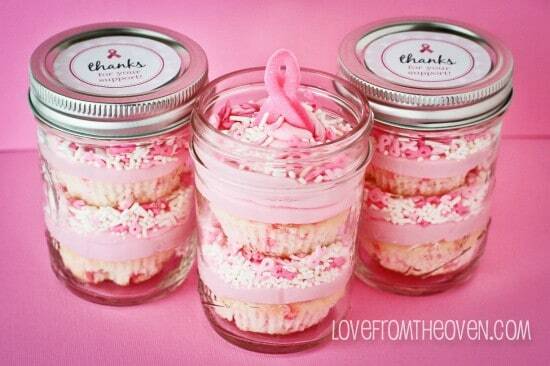 I love all the pink especially when it’s for a good cause. Bravo! I’ve been wanting to make your cake mix cinnamon rolls for months. This is the perfect variation. Okay these are gorgeous and for such a great cause. SO pretty! oh that is just amazing and it would be perfect for so many things. Those are all so beautiful! 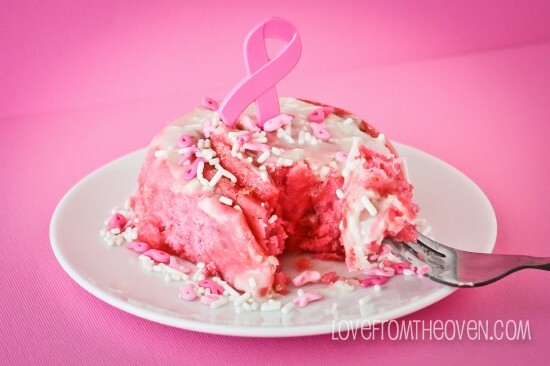 Loving all the PINK support this month! 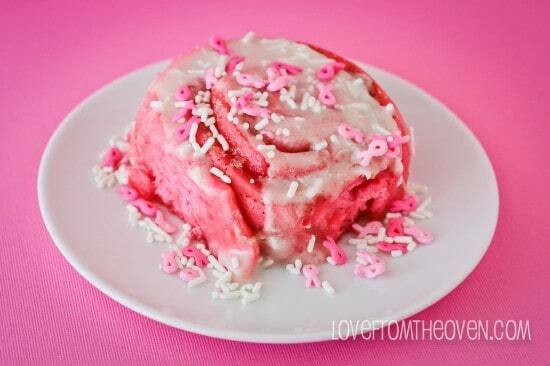 I love that you made pink cinnamon rolls! What a genius idea for a great cause!!! 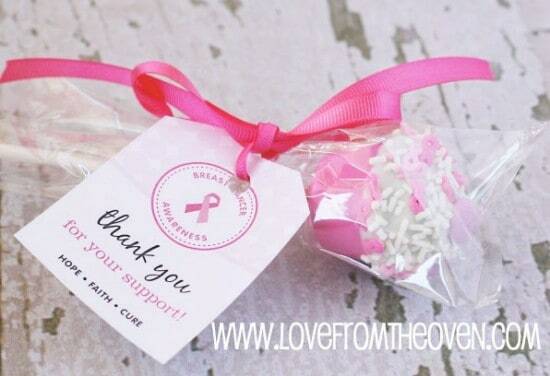 My mom is a breast cancer survivor so this is a campaign after my heart!!! These look so adorable and for a great cause, thanks for sharing! I have a question have you ever made them the night before I love the Idea of these for Valentines Day but I want to make then the night before, refrigerate or freeze and defrost then bake in the morning. ? I make them all the time the night before, but I don’t put them in the fridge or freezer. I actually like to make them late at night, frost them (let it soak in a bit) and then cover with foil and leave on the counter. Perfect in the morning! I almost never make these the same day we eat them (I’m not that much of a morning person!). 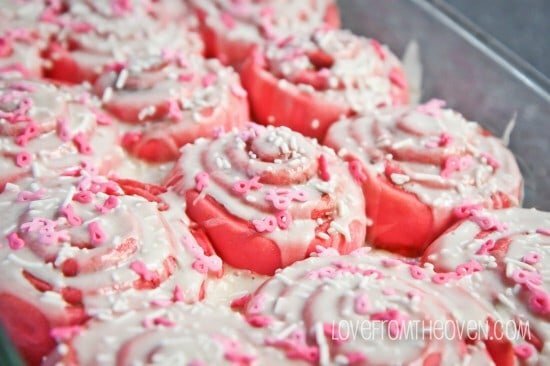 Do you use the same frosting for these as you do your original cinnamon rolls? It looks like you just use a regular frosting. Have you tried a cream cheese frosting on these? These will be great for Valentine’s Day! Quick question-I saw your comment about making them in the evening and leaving on the counter overnight. My 3 year old LOVES to help me bake and thought this might be a fun activity to do over the weekend. 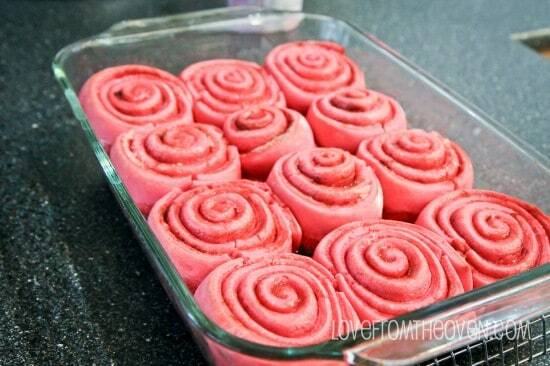 Do you think if we make the rolls and freeze them before baking, they will turn out as well? Was thinking then defrosting and baking the night before. Karyn, I know many people do that, I just haven’t in a long time so I can’t really speak to the results. I do know you need to really make sure they have proper time to thaw prior to baking. Good luck! These look great! 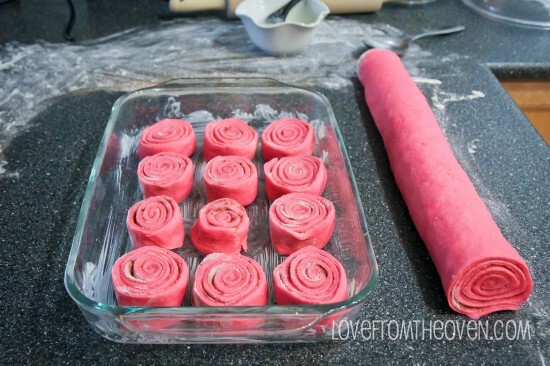 I’m going to make them for Valentine’s Day tomorrow! 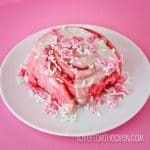 Found these on Pinterest and man, they are the most beautiful cinnamon rolls ever! I would love to include them in a roundup of Valentine’s Day treats on my blog (with full credit going to you of course!!). Thank you so much for sharing! What a great idea! I would suggest using all GMO free, organic ingredients and a natural food coloring like beet pulp for these, so not to ingest any carcinogenic foods. These look so great! I noticed in your other post the frosting was slightly brown, whereas it looks white on these. What kind of frosting did you use for these? Hi! these look so good. i would like to make it for my son’s birthday breakfast. can I make it ahead of time and put it in the fridge and bake it in the morning? Thanks in advance for a great idea! Hi Meena, I haven’t made this particular recipe ahead of time, so I can’t speak as to how it turns out. I do have some overnight cinnamon rolls on the site that might be a good fit though.